What do soybeans, primarily in the Midwest, have to do with corn in the Pacific Northwest, spring wheat in North Dakota or cotton in the Delta? 1. After 6 months of a 25% Chinese tariff against U.S. soybeans and an unfortunately timed record U.S. soy crop, we are now sitting on at least a 10% - 12% oversupply, which seems likely to increase. 2. Brazil is currently harvesting what is expected to be a 2nd best ever soy crop for that country, providing a substantial, if only partial, alternative to U.S. beans. 3. Even if current trade talks reach a favorable outcome, China now sees dependency on U.S. commodities as a strategic risk and are unlikely to return to previous purchase levels, at least for the next few years. 4. Over the past two years, soybean acreage has mirrored long dominant “king corn” at roughly 90 and 89 million acres for each crop in those respective years. For context, 90 million acres is more than all other major U.S. row crop and small grains combined. A 10% reduction in soy acres would be greater than the individual planted acres of all other crops except corn, wheat and cotton. 5. U.S. soy acreage must drop in 2019. Maybe substantially. Conceivably, enough not only to adjust to whatever the new normal Chinese export figure might become, but also sufficiently to begin to clear the current glut. 6. Already stressed commodity markets must adjust prices in order to incentivize the necessary acreage change from soy to other crops or possibly fallow. How many acres are we talking about? What is the potential impact and knock-on effects? First, a little context. How large is the issue? The 1st chart below shows in the bars, and indexed on the left axis, USDA estimated ending soybean stocks as of February 2019. These are the bushels remaining in the U.S. supply chain and storage as of the end of the “crop” year on Sep 1st of each year. The blue line, Stocks-to-Use ratio, is the remaining stocks divided by that year’s total use both domestically and in exports. As can be seen in the chart, as of February 2019, USDA projected the 2018/19 crop to have both the largest ending stocks and stocks-to-use ratio ever. By a lot. We are currently projected to have 910 million bushels remaining at 22.2% stock/use vs the previous record in 2006/07 of 574 million bushes and 18.7%. That’s 60% more than the previous record with some industry experts expecting this number could increase to at least 1 billion bushels. So how many acres must we reduce soybeans to correct the current imbalance? That depends on many factors of course but at least two important fundamentals are; 1) When in the production cycle will the Chinese begin purchasing U.S. beans again in large volumes (they already are making smaller purchases) & how much of our previous annual exports to China are we likely to regain or lose? And, 2) How much do we need to reduce inventories? I don’t pretend to know with certainty the answer to either question and this shouldn’t be taken as a prediction, but we can lay out some scenarios to get a feel for potential scale and impact. First, I believe the Chinese will need to return to U.S. soy purchases at some level and would prefer to do so sooner rather than later. They only produce about 1 ton for every 7.5 they consume and there simply isn’t enough capacity in Brazil or elsewhere to fully replace what the U.S. is able to produce and ship, in the near term (Say, the next 2-5 years. More on this later). As for reductions? As we stated above, the last record carryover was for the 2006/07 crop at 18.7% stocks/use. The markets adjusted, and possibly over reacted the following year, dropping 10.8 M Ac or 14.3% and landed at a tight carryout of 6.7% just in time for the commodity price run-ups beginning that year. But market and carryout volumes are so much larger now, we won’t need to reduce to a similar ratio as 06/07 to have a similar or greater acreage affect. For the sake of measurement, let’s just drive projected carryout supplies for the forthcoming 2019/20 crop down to 15%, a still historically high number and much great than the ten year average 5.5%. In the 4 blocks of the Soybean Supply & Demand Balance Sheet below, we begin in the left block with the world as it was before the tariffs, namely the 2017/18 crop year. In the second Block B) we use the current 2019 current industry estimated from the very respected shop of Informa Economics of 86.2 million acres and in each of the next 2 blocks we solve for the required 2019 reduced planted acres figure that leave us with a 15% stocks to use ratio at the end of that crop year and balance our large 2018/19 projected carryout against decreased export scenarios. In all three reduced acreage scenarios for 2019/20 we are using two of the USDA 18/19 assumptions: a 20 M bu import figure, the USDA 18/19 residual usage (other use/fudge factor) of 31 M bu. And a few of our own: upward adjusted domestic crush of 2,150 M bu to account for additional domestic livestock feeding under lower prices, and a trend 50 bu/acre U.S. average yield for the 2019 crop year. Just to minimize the afore-mentioned eye glazing, we’re jumping straight to the results. The chart reflects total U.S. soybean planted acres, acreage reduction vs. 2018, total exports, and estimated ending Stocks to Use ratio (CO/Use) for each of our three scenarios while the balance sheet which follows reflects how we got to those figures. 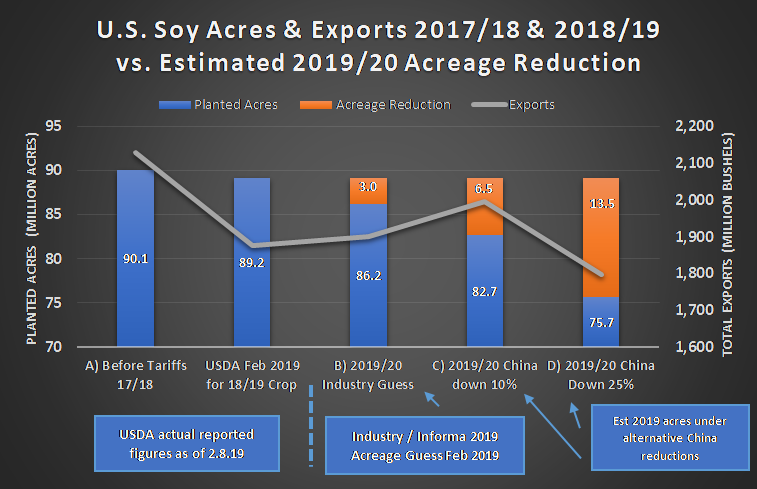 A) The current Informa / Industry estimate of a 3 million acre reduction and a slight increase in exports in 2019/20 vs. 2018/19 would actually increase the already unprecedented carryover from 22.2% to 24.3%. B) If exports to China would recover to being down only 10% vs previous U.S. acreage would need to drop 6.5 million acres to reduce carryover to previous market highs of around 15%. C) If we lose 25% of our previous Chinese sales, acreage would need to drop 13.5 million acres to get back to a 15% carryover. Just to restate, these figures aren’t meant to be predictions, but merely to place some realistic bounds around the scale of acreage shifts required under a new export reality. Although not impossible, clearly the current industry estimate of 3 million doesn’t cover the near term issues of both reduced export needs and reducing inventories; it’s either a bet on drought in North or South America, a return to previous U.S. exports levels, or just prolongs weak commodity prices. Won’t the Flows/Buyers Just Switch Between U.S. & Brazil? Obviously to some degree yes, and they currently are. But the reality is, even if we could logistically do a perfect swap of previous U.S. export volumes to China with Brazil’s non-China bound exports, there isn’t enough Brazilian exports to countries other than China to cover those previous U.S.-China shipments. As can be seen in this graphic, 48 mmt of Brazil’s 70 mmt of exports went to China. This would leave 22 mmt at current production levels, only 59% of what would be needed to replace U.S. shipments. Argentina, the world’s 3rd largest exporter, exports mainly soymeal due to internal tax reasons, which can’t be stored as long as raw beans and doesn’t help China’s existing crush mills. Won’t Brazil Just Increase Production? Once again, of course they will and have, or at least tried to. USDA’s current estimate of Brazilian beans harvested is an acreage increase of 3% (as in three percent) but a 3% reduction in tonnage vs the previous year due to drought in major production regions. Honestly, I’m surprised the acreage increase is that low, but the reality is, in addition to a high cost of capital and environmental restrictions on acreage expansion, Brazil has huge logistics and infrastructure limitations and bottlenecks. Danial Amaral, Chief Economist with ABIOVE, Brazil’s vegetable oil industry association, gave a great presentation on Brazilian infrastructure issues at the 2018 USDA agricultural outlook. Two of his slides from that presentation are included below, with photos of the legendary (for Ag geeks anyway) multi-day truck unloading lines and traffic jams as well as a comparison of the Brazilian vs U.S. rail networks. Note Brazilian rail is little changed since 1930. More telling is a quote from Danial’s summary closing slide: “New projects are ongoing, and the deficit should be fully resolved in 10 to 20 years”. To be fair, Brazil is making improvements and has added additional port and handling capacity in recent years, but they have a long way to go. Could prices swing sufficiently for Brazil to import U.S. soy for its crush mills and feed use to replace additional tons shipped to China? Maybe, assuming they have enough port capacity to handle the additional imports. But the larger point is they can’t completely replace U.S. exports to China in the near term. China is making adjustments to both reduce soy content in livestock rations and replace the lost protein content and oil with usually less economic alternatives such as canola, but the takeaway here is that although the U.S. will lose some amount of the Chinese market, it is unlikely to lose all of it in the near term. But that doesn’t mean the losses won’t be painful to U.S. farmers. So Where are Soy Acres Likely to Decline? And for that matter, where do they go? This is where we try to tie it all together. A good place to start is to think about where do we typically see the most soybean acreage volatility? And where is it least profitable to grow? What alternatives might they have in those areas? If you’ve never visited the “Agricultural Economics Insights” website where Purdue University agricultural economists Brent Gloy & David Widmar post concise and, well, very insightful, easy to follow short articles about current economic issues in agriculture and you are in any way investing or operating in agriculture, you should add it to your favorites bar and subscribe to their updates. Relative Variation in Planted Soybean Acres by County (Coefficient of Variation). 2000-2013. Although the basis map is less detailed than the acreage volatility map, the two maps together paint a good picture of where soy acreage tends to vary the most as well as where farmers who will be at a price disadvantage operate relative to other soybean growers. The red counties in the acreage variation map make also sense when you understand the agronomics; the northern high plains have a shorter growing season, less rainfall and are farther from gulf port shipping facilities, southern counties not along the Delta are hotter, have less rainfall when beans need it, and soils less accommodating to soybeans. The Red in the basis maps reflect that there are less crush facilities where there are usually less soybeans, distance from gulf port shipping, and in the northern high plains, the fact that the majority, if not vast majority, of those beans have been traveling to PNW ports for export to, you guessed it, China. So, look for soy acres to be down in the high plains, where they’ll consider switching to spring wheat, grain sorghum, other small grains or hay and the southern high plains in Oklahoma, Texas and the southeast in counties not immediately adjacent to the Mississippi, where they’ll consider grain sorghum, and cotton. Anyone who has the water and strong local markets will consider corn. The least productive ground in those areas may go fallow to wait for better times. All of which will affect markets in the Pacific Northwest and everywhere else. Scythe & Spade specializes in facilitating investments in agribusiness by strategically matching investors with top producing farmland and operators. www.ag-management.com.